The National Center for State Courts (NCSC) and the Ministries of Legal Affairs and National Security partnered to deliver a Criminal Gang Investigation and Prosecution Workshop for more than 40 ministry officials, public prosecutors, police investigators, and corrections officers August 6-7 in Nassau. 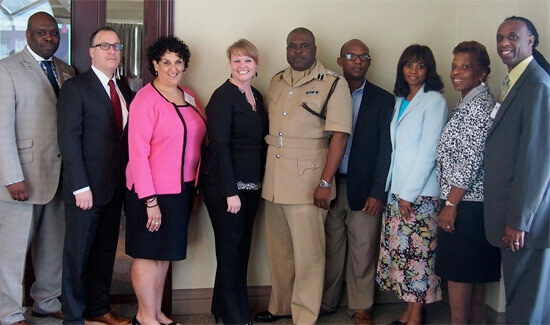 The workshop was funded by the U.S. Embassy’s International Narcotics and Law Enforcement Affairs (INL) Section through the Caribbean Basin Security Initiative (CBSI) and was part of ongoing U.S.-Bahamian cooperative efforts to fight transnational crime and increase efficiencies in the administration of justice in The Bahamas. The two-day program—conducted by a former state prosecutor and circuit court judge, an assistant district attorney, a retired 1st grade detective, and a police sergeant—was designed to enhance attendees’ knowledge of best practices in investigating and prosecuting gang-related crimes. Workshop topics included intelligence gathering, evidence analysis, and group criminal liability, and utilized hypothetical scenarios and group breakout brainstorming sessions. In the peer-to-peer learning environment, the U.S. criminal experts engaged in interactive discussions on the legal framework and investigative tools available to investigate and prosecute gang-related offenses, incorporating issues such as the forfeiture of proceeds from criminal activity. During the course of the workshop, participants formulated recommendations to enhance and improve investigative and prosecutorial practices in combating gang-related crimes and violence in The Bahamas. At the opening ceremony on August 6, Ministry of Legal Affairs Permanent Secretary Cynthia Gibbs encouraged an active exchange of ideas that considered The Bahamas’ unique legal framework and approach to the administration of justice. Additionally, Ministry of National Security Permanent Secretary Carl Smith explained that addressing gang-related crimes required a whole-of-government approach and encouraged a substantive discussion of existing efforts as well as new ideas to deter, investigate, and prosecute criminal organizations in The Bahamas. Workshop participants received a variety of materials including exemplars of U.S. statutes, indictments, plea agreements, intelligence gathering instruments, model case management tools, and institutional policies/procedures. The Ministries of Legal Affairs and National Security hosted a series of stakeholder discussions in advance of the workshop, laying the groundwork for a successful event. Caption: From left: Sergeant Landon Wade, Chicago Police Department; Assistant District Attorney Jeremy Shockett, Bronx Count District Attorney’s Office; Judge Peggy Chiampas, Circuit Court of Cook County; Kristin Gilmore, INL Director, U.S. Embassy; Deputy Commissioner of Police Anthony Ferguson, RBPF; Permanent Secretary Carl Smith, Ministry of National Security; JoAnne Richardson, National Center for State Courts; Permanent Secretary Cynthia Gibbs, Office of the Attorney General/Ministry of Legal Affairs; Detective (retired) Wilford Pinkney, Jr., New York City Police Department.